Since linking with Jamie Morris at Forensic Focus to create a Mobile Forensics Discussion Forumto bring mobile telephone evidence to a wider audience, I have had several discussions with people who are new to mobile telephone evidence and have asked me to provide further discussion on matters concerning Checking Masts. Also from police sections asking me to open up the discussion as to what might happen when Mast checks are not made and how that might impact on a criminal case. Whilst the criminal case discussion is hypothetical, some events happening in the discussion are factual and drawn from a number of criminal cases.The necessity to check with a mobile network operator regarding details of a particular Mast (Cell Site) and the bearing of coverage (azimuth) from it, for a particular Cell ID, at the material time to see whether it has changed prior to conducting cell site analysis is a useful rule to follow. There are, of course, many other matters that need to be checked also, but I have simplified the issues for the purposes of this discussion. The details of Mast changes are recorded by Operators and recorded in their databases. Single Point of Contact (SPOC) is not prevented from asking an Operator about Mast details and obtaining the relevant information. However, as a SPOC doesn’t decide what evidence should or shouldn’t be required for a criminal investigation, the SPOC should be asked to obtain the Mast information. 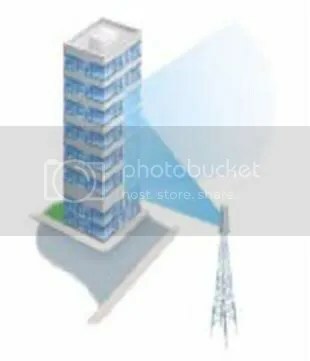 Below is an image (a) which displays a Mast’s radio coverage for a particular Cell ID illuminating in a westerly direction towards a block of flats. 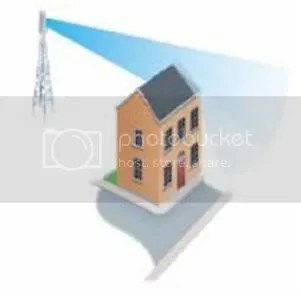 The next image (b) below displays the same Mast (as above) relating to radio coverage with its associated Cell ID but this time the radio coverage is illuminating in an easterly direction, in the opposite direction towards a house. For the purposes of this discussion the Mast is shown close to the properties in both images. This was done for artistic purposes and is not intended to mean the Mast is actually that close to both properties. Also an actual Cell ID has not been shown but the inference about Cell ID being relevant is inferred by the presence of radio coverage being displayed. Imagine if you will that on a particular date, let us say the 30th March 2008, a dead body is found in the house, shown in image (b). The police have been alerted to the property by a neighbour because of a dreadful smell emanating from the direction of the house. Upon entering the property the police find a decomposing body of a woman on the floor. The Pathologist is called and indicates, following assessment of the decomposing body, that the body had been dead for approximately two weeks. That would generate a time line back to Tuesday 16th March 2008. The police conduct door-to-door enquiries and one neighbour next door but one mentions that two weeks ago as she passed the house there was shouting emanating from inside the property and cries for help. The neighbour thought nothing more of it because the couple that lived there had regular arguments, which the neighbours and passers-by could overhear.The police asked the neighbours had they noticed anything else? One lady who lived a few doors away replied that she looked out of her window and that she had seen the man that lived there leave the property at about 8.30pm, and that would have been a Tuesday, and funnily enough that was about two weeks ago. To cut a long story short, the police found the man who lived in the house a month later, seized his mobile telephone and having retrieved his mobile telephone subscriber details, obtained call records and identified the Masts that routed mobile calls to and from his mobile phone. From the records it was noted that two weeks before the body was found his mobile had used a Mast for a call (on Tuesday at 8.00pm) the Mast was sited 2.4Km away from where he lived with his partner. This was also the nearest Mast to the house. The police called for radio test measurements to be conducted outside the house three weeks later. The time-span from the estimated time of death to radio testing was approximately 9 weeks. The radio tests confirmed that the Cell ID recorded in the call records is the same as detected outside the house. The man, during questioning, confirmed he had not been back to the house since leaving on the Saturday. That being the Saturday prior to the Tuesday when it is approximated the death took place. He had also been living in a Bedsit because the relationship with his partner had irrevocably broken down and they had agreed to split and go there separate ways. 4) The radio test measurements that show the Mast’s coverage, thus Cell ID, used by the suspect’s mobile phone illuminated outside the house. So at minimum there appears to be four good pillars of evidence. However, when the radio test measurements were conducted no checks had been made with the mobile operator whether any changes had been made to the Masts in the area prior to radio test measurements being conducted. It subsequently came to light at trial that the Cell ID illuminating towards the house (image (b)) had only been illuminating eastwards towards the house from Thursday 18th March 2008 after the alleged murder due to changes at the Mast. Prior to that date the Mast had been illuminating westwards, towards a block of flats (image (a)). So when the police had noted from the suspect’s call records that over the last few months they showed the suspect’s mobile phone using a particular Cell ID for mobile calls that the police thought could be made or received from the house, they were mislead and operated under a false assumption. The suspect had, in fact, been having an affair with a married woman in the block of flats (image (a)) and didn’t want to say anything for fear of reprisals from the woman’s husband who was known to have a temper and may take it out on the woman if she was called as a witness. It was this affair that the victim, when she was alive, and been tipped off about some months earlier and the cause of the couple constantly arguing. As to the other pillars of evidence: 3) and 4) were no longer valid and the woman with whom the suspect was having an affair corroborated the dates and times she was with the suspect. As to 1) and 2)? On the fateful day, 1) the argument that was heard by a neighbour turned out to be the victim’s ex-boyfriend from a previous relationship whom she had given evidence against him for drug dealing, some 5 years earlier, and who had been released from prison 20 days before the murder. He had vowed to seek revenge against the victim. 2) The neighbour who saw the suspect at 8.30pm at night in fact saw a silhouette of the man she thought was the suspect because it was 8.30pm at night and her eyesight wasn’t as good at night. The silhouette leaving the house was the ex-boyfriend leaving after having murdered his ex-girlfriend. In consequence, by not checking with the operator about their Masts prior to conducting radio test measurement caused lost investigation time to find the real culprit, unnecessary redundant evidence, increased costs, investigation time increased exponentially, apart from wrongly accusing a person. Moreover, as checking the Masts is a well known procedure, not to have checked it during an investigation may amount to act of intent to plant evidence to create incrimination against someone by using an act of deliberate omission during an investigation. This is only a hypothetical discussion, but if these acts were operated in reality on a regular basis in criminal cases and applied as policy in widespread use across England, it may potentially lead to £20 millions in retrials. Of course that shouldn’t be possible arising from the ‘Golden Rule’ of disclosure, enunciated by Lord Bingham in R -v- C & H (February 2004), when he said that ‘fairness requires that full disclosure should be made of all material held by the prosecution that weakens its case or strengthens that of the defence’. The test is an objective one and is grounded on what is ‘reasonable’. However, the guidance makes it plain that an expert witness is no longer to be trusted to exercise his or her own judgment in deciding what falls within this definition and what is and is not relevant. It is the influence of the Golden Rule placing affirmative duties on the prosecution from 2004 onwards that safeguards the reliability of evidence in criminal cases. That suggests were Her Majesty’s Inspectorate called upon to require the prosecution tomorrow to provide, from randomly selected 200 cases from across the country by the Inspectorate, documents of enquiry to a particular operator seeking to be notified of any changes to a particular Mast in a particular case and the documented response received from the operator, they could do so. That doesn’t mean to say if the prosecution mobile telephone case has 50 Masts used for calls that documentation for each of the 50 Masts would be necessary, as rarely are all Masts relevant to an alleged crime, anyway, and a large proportion being used for padding simply to show movement. The relevant Masts are those where the Masts and coverage can illustrate that the mobile telephone or telephones could potentially be at the scene of crime, which on the whole usually relates to the last three to six Masts nearest the scene of crime. Besides I couldn’t see the prosecution being hoodwinked into believing that because there are 50 Masts in a case that the number amounted to far too many enquiries to be made to the operator and so didn’t make any enquiries at all. As I have mentioned above this is purely hypothetical, but hopefully it illustrates the importance of Checking Masts before conducting radio test measurements. « Should Computer Forensics Professionals Consider Changing Jobs in a Recession?